As the name suggests, socratic seminars are derived from the teachings of Socrates, the ancient Greek philosopher who encouraged his pupils to explore their ideas/beliefs/assumptions through rigorous and extensive questioning (Socratic Questioning/Dialetic Approach). From this questioning evolved a seminar style used on literature classes and in University tutorials. It encourages students to pick apart an interesting text (fiction, non-fiction, poem, historical artefact, film, whatever) and the strands of meaning threaded through it, in a cooperative, formalised discussion. I did a fair bit of a reading up on it and found this document, this resource and the readwritethink website particularly helpful. A shortish text appropriate to student level, preferably something that deals with complex, challenging themes. I selected the short story Harrison Bergeron by Kurt Vonnegut suggested on this list of socratic texts. Partly because we’d been chatting a lot about North Korea in class, the story presents a dystopian future and deals with the concept of equality, plus Vonnegut is one of my favourite authors and I knew my class would dig it. A few prepared questions relating to the text to get the discussion going. Two types of questions are needed, interpretive (referring to and analysing the text) and evaluative (dealing with it’s thematic concepts in relation to your own values, beliefs ideas). See procedure for my examples. If literary critique is not your strong suit the online study guide sparknotes helps with themes. Even though I studied English Lit I’m a bit rusty so I took a peek there. Prepared roles for the inner and outer circle – I invented mine a bit on the spot but there are some good suggestions for the inner circle at the end of this and outer circle here. There are standard/classic roles but given we’re adapting it for second language learners I don’t reckon Socrates would mind if we were to create our own interpretations to better facilitate discussion. A simple powerpoint with the basic background info is helpful, here’s my slightly rushed one. Please ignore any punctuation errors. Before the Class: Ideally you need at least 8 students so know in advance roughly how many will be turning up on the day (you can take part if necessary). It’s essential to set the reading text in class or for homework at least a couple of weeks in advance. Give them a task to focus their reading, and make sure they realise they won’t be able to participate otherwise. I asked my students to consider how the text defines ‘equality’ but a comprehension task would also work. To check students had read and understood the text and troubleshoot any issues with vocab or narrative we started with a word-cloud of the whole text. Students first checked they understood the vocab, and it’s significance in context, then jointly reconstructed the story orally using vocab from the cloud (powerpoint slide 2). 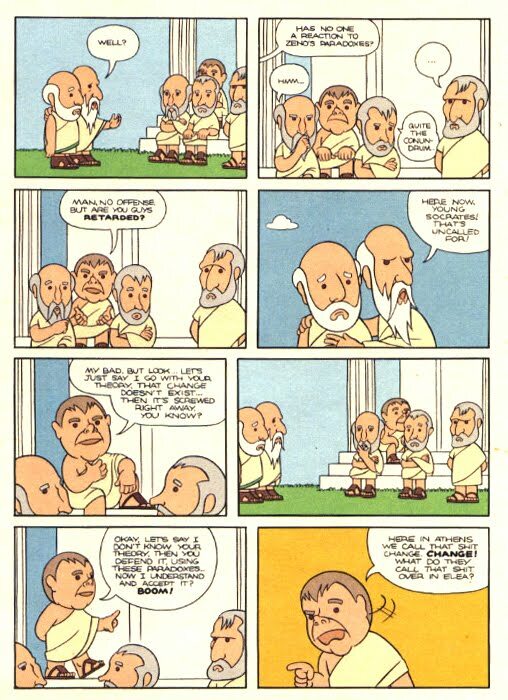 I elicited what students already knew about socrates (surprisingly little!) then gave them a bit of background with a short text as I knew they’d be interested, explaining the basic premise of a socratic seminar with a diagram and by looking at examples of socratic questioning (slides 3-5). To scaffold and support weaker students, prime the class and relate the concept to the language needed, they then completed a short categorising task, identifying useful language according to it’s function (slide 6 + handout). Students then spent a few minutes creating a list of rules for the seminar with it’s core values in mind, to which I added a couple. It was interesting to contrast this style with debates (we’d done a formal one in a previous class) as the aim of the seminar is not to disagree or ‘win’ but jointly explore. Think collaborative not oppositional. I assigned roles to students in the outer circle taken from the first 4 in this resource as below. What does George mean by “going back to the dark ages”? I just kind of flung it in there then sat down, but the students caught and ran with it quite easily as they were already really into the story and raring to go. During the discussion I took notes on language, and when the discussion began to stray/run its course I guided them with a further question from my list, evaluative this time. Does Vonnegut believe equality is something worth striving for? Do you think it is? While observing I started to notice certain student behaviour, e.g. one straying into general opining without explicit reference to the text, another student making minimal contributions, a third dominating/interrupting. Although I hadn’t planned to assign roles to the inner circle I felt it would help, so quickly scribbled out these with examples of language, pausing the conversation to distribute them depending on their behaviour. We continued like this, until about 10-12 minutes of discussion were completed, when we took a break. The outer circle joined the inner circle at the central table, and began with the ‘reporter’ summarising what they’d discussed. The ‘talliers’ then shared their findings and the silent contributor added their contribution. They then paired up for a quick ‘coaching session’ while I boarded good examples of language and correction/language focus. After a quick run through of this we returned to the discussion with a further prompt question for 5 minutes. 8. Regrouping, I felt confident now that students could create their own questions, so they spent a few minutes brainstorming those to consider in the next round. 9. Roles reversed, the inner circle became the outer circle and visa versa. The whole procedure was repeated using the brainstormed questions, minus the roles for the inner circle as by now students had cottoned on to what was expected to them and were more considered in how they contributed to the discussion. 10. To round things off we regrouped and completed a self-evaluation and reflection questionnaire, then fed back about the activity itself. I was really pleased by students’ positive responses as I really wasn’t sure how well it would go down! I would 100% try this again and even make it a regular part of a more extensive course. It’s extremely learner-centred – The teacher’s role is facilitator, setting up the discussion then taking a backseat (even if there’s a bit of painful silence involved), intervening only to guide the conversation occasionally with pertinent questions. This role can also eventually be adopted by the students themselves. Very empowering. Both process and product orientated – Students must gain a developed understanding of the text they will discuss, self-monitoring understanding of vocab and any potential ambiguities the text presents, in order to take part in a successful discussion. They must also be aware of their own and each other’s participation when speaking, which can be augmented through roles assigned by the teacher, to compensate for more/less dominant contributors, for example. It goes well beyond the usual “discussion language” seen in textbooks, ample opportunity to focus on emergent language, particular lexical sets, feed in whats missing etc. Lots of nice incidental language came up and there’s ample opportunity to build in stages focusing on this and correction between discussion rounds. It encourages critical thinking, is cognitively challenging, clearly contextualises language, both within the text and to discuss the text. Personalised – Students need to relate the text to their own beliefs and values. Great learner training, an EAP study skills winner. It’s likely students will be doing this, or some version of this, on their Uni courses for reals. A would also be a great activity for reading groups and higher level YLs using readers like they did at BC Colombia. We didn’t have time to use the text apart from in the seminar but you could get a lot of mileage out of it! A nice alternative would have been to get each outer circle member to monitor an individual in the inner circle, even using a rubric something like this. Particular language or speaking strategies could also be tallied to make the language element tighter. Language focus was fairly flexible (flimsy?) but at this level it could afford to be, it’s predominantly a speaking lesson anyway. With lower level groups, we’d definitely need to spend more time focusing on the text in advance. To bring it back to language though it might be nice to record good and corrected examples of functional language and ask students to categorise them again after the discussion, according to those we looked at at the beginning of the lesson. A model in the form of a video might be useful for lower level/less confident groups and there are lots online which would do the job, like the one mentioned before. Also, more scaffolding of language would be needed at lower levels. Anyone done this before or fancy giving it a crack? If you do, please let me know how it goes, I’d love to hear from you!! A really interesting idea! I hadn’t heard of Socratic Seminars either. I have a group of FCE level 17 year olds who need a change from the old routine, so I’ll definitely try this out with them. Thanks for the post! I like the idea of simplifying the observation tasks, Faye. I managed to try this idea out with my FCE teen group yesterday with a Roald Dahl short story and they absolutely loved it! What story did you use? I think Roald Dahl should be used as much as possible! Man from the south and Lamb to the slaughter are two favourites, but any of his short stories really. That´d be a nice differentiate task for the less literate students, too. I ´lolled´ at myself the other day because I came across a visual diary I tried to keep for about a week… But for some visual thinkers I think it´d really work, and I was just talking with an upper int class tonight about how some things in language never translate, but you visualise what they mean. I actually have never known a socratic discussion to not work for anyone (obviously that depends on criteria) if it´s set up well. That is v cool and comprehensive. I’d love to try it out if I ever went back to teaching. The concentric circles classroom set-up is familiar from a speaking activity/role-play called ‘Good Day, Bad Day’ which I loved at Isca School of English in Exeter (think it’s in a book called ‘Spontaneous Speaking’. Great post! We’ve noticed a lack of materials on the market for our high-level teens and Socratic seminars have been one idea. There’s more on it in the English classroom here Thanks for sharing! Thanks for the feedback Helen! And apologies for the delay in my reply, been mid-move to Vietnam for the summer. I’ve just had a look at your posts about using the Socratic method in EFL, thanks for sharing it with me, what a broad and thorough discussion! That class really had an impact on my teaching in many ways and I’ll definitely be trying to apply what I’ve learnt to other areas of my teaching now, you’ve provided me with a great resource, particularly in relation to encouraging higher order thinking with my Vietnamese teens and adults. Looking forward to exploring the rest of your blog. You are too kind! Thanks.